Each year it gets tougher and tougher to pick out the losers. I feel like I’ve said that before, but it’s honestly the truth. There are drafts that I don’t necessarily like, but team’s filled needs, so how can it really be a loss? I’d also say that with the amount of technology that is around these days, it should be getting harder and harder to miss on prospects. Though we all know that isn’t the case. It’s always tough to put teams that pick players you like into a “losers” list. 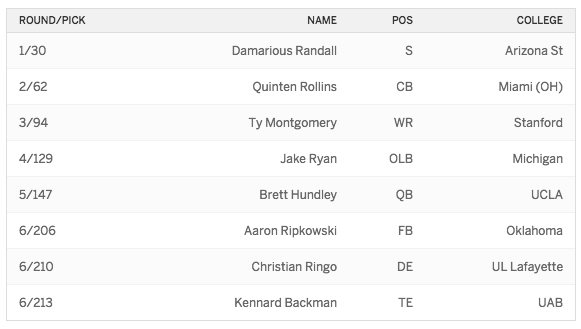 I really like Shaq Thompson and Devin Funchess and the Daryl Williams pick is solid as well. But the issue is people still don’t know where Shaq Thompson is going to play and Devin Funchess has some major issues that he needs to work through. He’s stiff in and out of his breaks, struggles to get separation and has some drop issues. That being said, the idea of Funchess lining up opposite Kelvin Benjamin is pretty enticing. Sure they’re close to the same player, but both of them are good prospects. But the biggest issue is the fact that the Carolina Panthers have a devastating amount of holes on the offensive line and waited until the 4th round to fill it. And no, I don’t consider signing Michael Oher in free agency filling it either. It’s tough to win without a first round pick, though I do like some of their picks. I’m a fan of all three of the Florida State players that they selected and John Miller will help out the run game quite a bit. But, they still have holes at nose tackle and at safety. If they shift Darby to try to play safety, then that will help fill one need, but the Bills were a bad team last year and they paid a very big price for trading up for Sammy Watkins last year. Now, this all being said, the Bills have met with La’El Collins. If Collins gets cleared and they sign him, then you can take this draft off of the Losers category. That would their first round pick basically and it would be an absolutely massive pick up. I love Todd Gurley and I think that he’s going to be a very good NFL player, but I still wouldn’t have taken him 10th coming off an ACL injury. He was the least of their problems with this Draft though. 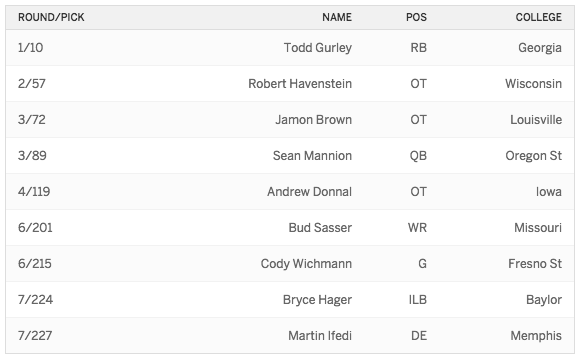 They did do a lot of work to try to shore up the offensive line, but I didn’t love their picks and taking Sean Mannion in the third round with Nick Foles at starter seems like a waste. They didn’t address their need at wide receiver until the 6th round, if you even want to say Bud Sasser fills that need, and didn’t even give cornerback a look. Kenny Britt, Tavon Austin, Stedman Bailey and Brian Quick doesn’t exactly strike fear into opposing secondaries. And while they are going to have an improved running game, they’re still missing a marquee wide receiver. One dimensional offenses never get the job done, just ask the Lions what it means to have a phenomenal passing game and no run game. The Saints did a good job adding depth at linebacker with Stephone Anthony and Hau’oli Kikaha; while PJ Williams and Garrett Grayson could end up being eventual starters for them. 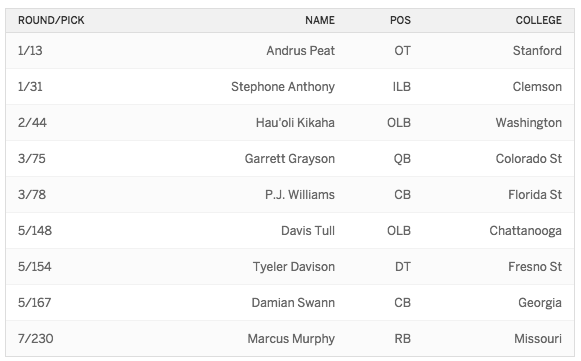 They decided that they wanted to shore up the offensive line, and rightfully so, but I don’t like Andrus Peat. I think that he’s slow and lumbering and gets beat more than he should. Now you can say that I’m cherry picking a play, but I don’t want my first round left tackle that is supposed to be protecting my franchise quarterback getting blown off the ball like this. Especially when he’s weighing in around 6’7″ 315 lbs. Could he end up being a good player? Sure. But I don’t think he’ll be able to provide an instant impact. And while adding Max Unger and a 1st round pick was helpful, they didn’t do anything to fill the hole left at tight end when they traded Jimmy Graham; I’m not a Ben Watson fan. On top of that, after they traded Kenny Stills for practically nothing, they didn’t fill the hole left at wide receiver. Brandin Cooks showed major potential last year, but I don’t love that Nick Toon and Marques Colston round out your top three receivers. They’ll need CJ Spiller to come in and catch a lot of passes. The Saints are truly paying for being in Salary Cap hell right now and they’re going to have some growing pains. I don’t want to call this draft a loss, but it isn’t a win…not yet anyways. It’s an extremely intriguing first three picks and it could end up being a great draft. Damarious Randall reminds a lot of people of Jimmie Ward and he could make for an athletic pair at safety with HaHa Clinton-Dix. Quinten Rollins is as raw as can be and has only played one full season of college football. Rollins was a ballhawk though with 7 interceptions and if he is given time to develop, could end up being one of the better corners to come out of this draft. Ty Montgomery meanwhile, is not one of my favorites, but he will add an interesting element as a return man and almost as a utility player. I would expect them to try to use him as a less dynamic Percy Harvin. Jake Ryan was a great pick for the 3-4 defense that they run and while most expect him to play ILB, I think he is better suited for the outside. Brett Hundley also gives them another boom or bust developmental prospect who can sit for 3-4 years behind Aaron Rodgers and be groomed for the future. This entry was posted in NFL and tagged 2015 NFL Draft Losers, Andrus Peat, Buffalo Bills, Carolina Panthers, Damarious Randall, Devin Funchess, Green Bay Packers, New Orleans Saints, Quinten Rollins, Sean Mannion, Shaq Thompson, St. Louis Rams, Ty Montgomery. Bookmark the permalink.